Posted by Jon in NECA, Review with 0 comments. The Pacific Rim action figure line by NECA has been going on for a long time now. Far longer than I think most people would expect a tie-in toy line would live for a non-franchise (yes I know Pacific Rim 2 is planned, but it seems to go in and out of cancellation limbo every two weeks) movie. This release marks the third year out from the film. While NECA certainly doesn’t have an as aggressive schedule as previous years, they still have a solid lineup. Ultimate Striker will also be joined by Ultimate Gipsy Danger, and they will have a pair of new large-sized Kaiju to fight in Mutavore and Hardship. I have to assume the crew over at NECA is pretty attached to this line, if only because they are constantly reinventing it. The original two waves were made for a mass retail release that never ended up happening. So in order to keep the costs down for those Walmart shelves certain aspects of the figures like paint, articulation, and scale had to be compromised. Despite Walmart backing out and the scaled back features, the figures were a pretty giant hit. At this point NECA in a way “rebooted” the line to a slightly larger scale and price point in order to usher in a new quality standard for the Pacific Rim series. But now we have every Jaeger seen in the film! So where do we go from here? There were some figures from the first two waves that could use a serious update. 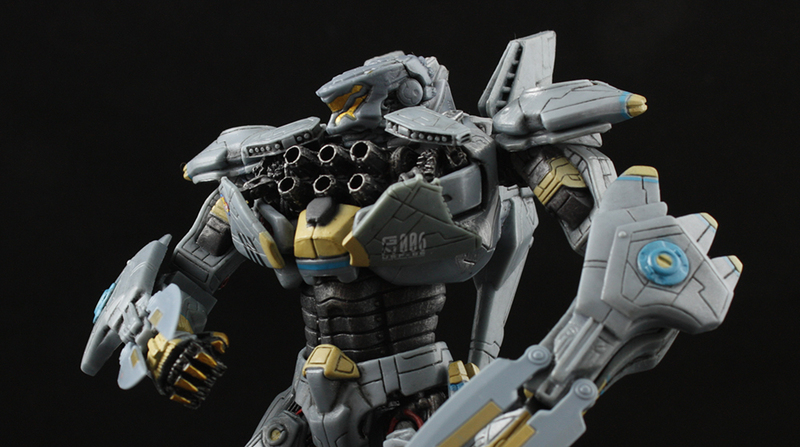 So why not bring NECA’s “Ultimate” figure concept into the Pacific Rim line? This seems like the logical next step, and the Ultimate figure line is just so hot right now. So Striker Eureka gets the honors of being the first Ultimate release in the Pacific Rim line. As with all Ultimate releases, Striker Eureka comes packaged in a book-style window box. He includes an alternate chest, three firing missiles for the open chest, two pairs of sting blades for his wrists, and the nuclear payload from the end of the movie. The previous figure allowed you to remove his wrist-blades when not in use, but there was no place to actually store them. This is remedied in the Ultimate edition because they can now be swung back and stored inside of his forearms. The open chest being a swappable extra is a great addition to this figure, and I’m glad it wasn’t decided that I’d have to buy a second to get this version. The chest has six exposed cannons along with three missiles that can be plugged into any of the barrels. The missiles “launch effects” all have different lengths, and since there are only three you can never make a full launch. I suppose if you like him enough it may be worth getting a second for the additional three missiles. Also with a second it leaves open the option of having both a dedicated open and closed chest figure. There is a great amount of detail sculpted into the body of Striker. I didn’t realize how much of an improvement this figure was over the original until I had a chance to pull it out and compare. Oh lord! The old Striker looks like a much softer version of the new one. The original is completely devoid of all the panel lines sculpted into the new one, also the new one’s silhouette is sharp and clean while the old one is much more round. Ultimate Striker is like a completely different figure with all of paint and details added. He’s an improvement in just about every way. Just about every way, but there is one little issue with my Striker’s hips. Mine just flap all over the place which made taking that picture of him shooting missiles out of his crotch very tough. While the loose hips are annoying, he can still stand fine on his own. It’s just extreme poses can be a little rough, or at the very least require a stand. I do appreciate that he has decent range on his hips and ankle ball joints, though. That’s my biggest problem with the Gipsy Danger 2.0 figure, is that the hips and ankles have LESS range of motion than the previous one they set out to improve. I was hoping the Ultimate Gipsy would address that issue, but as far as I can tell it is the same sculpt with a LED in the chest. Ultimate Striker Eureka is a pretty giant leap of improvement over the first release. It also comes with a great set of extras to really complete the package for this Jaeger. If you are still collecting the Pacific Rim line after all these years, then Striker isn’t one you want to miss out on. In fact, if you get this one just throw the old one right into the trash. At the price of around $20 retail you’ll hardly find a better value. Plus, you’ll need somebody to fight Mutavore who should be shipping in the next couple months! Ultimate Striker Eureka is available at Amazon or Entertainment Earth!